Day 15: Amy is walking. Lots. 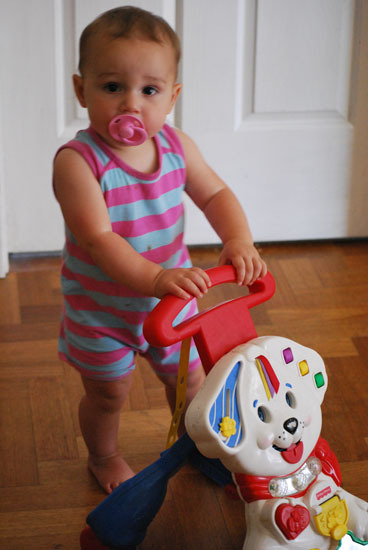 Usually by herself but she also likes to get this baby cranking around the house. You would have thought she would have walked earlier because we have no carpets. But no. Day 16: Kate ended up staying home from school as she has a cold. So, what better way to spend the day than by playig a couple of rounds of Buzz Jnr? We played Dino Den as the other 2 discs have scratches. Hmmm. A repair kit wont be far away as we all love playing, even Steve and I. 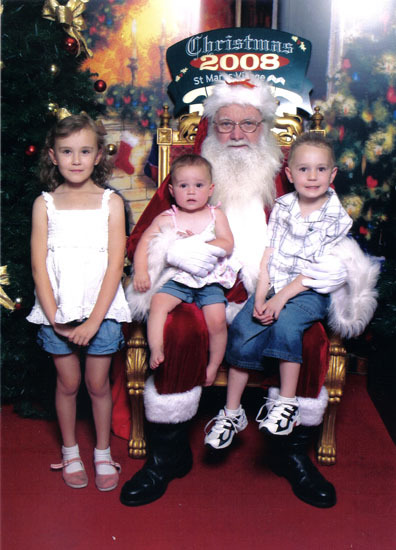 Day 17: Santa Photo! Sorry the scan is a little washed out. He was such a good Santa and knew the trick to calming down Amy. She didn't cry at all, although the lady took at least 10 photos because Luke kept smiling funny. Gotta love digital media. Day 18: Luke finished at Preschool. They had a party and a presentation and a visit by someone jolly! 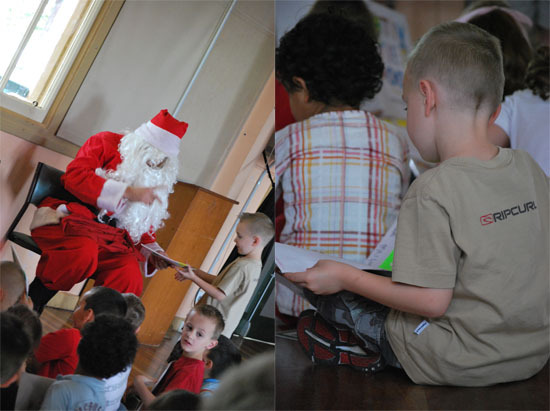 Luke received a book from Santa and he also received his coveted scrapbook that the kids had been filling out throughout the year. As soon as he sat down he started leafing through it. It shows alot of progress in his writing etc. He cannot wait to start kindy. He has really blossomed in the last year. I am so proud of my little man. not sure if it's just my computer, but your pics aren't coming up! Loved reading your little descriptions though! congrats to Luke 'graduating' preschool! thanks for nominating me for an award too;) i appreciate it ..i love reading your blog too! hi, thanks for your reply regarding digital slr, on SM forum.Have checked out your photos and they look pretty gorgeous to me[and the kids].my sister has been doing a photography course and her instructor is a profesional photographer who uses nikon, so sounds pretty good to me.thanks again. hey Beth - love that Christmas tree skirt! !